The 1980s were the apex for hair metal and cheesy movie montages, but not for Manchester United. For a club that had lifted 7 first division trophies since 1908, zero from ’67 to ’92 had to be a painful drought. While Liverpool dominated the decade, United mostly hung around 3rd or 4th place, unable to return to the top. I bring this up because, from 1980 to 1992, Manchester United wore adidas jerseys. 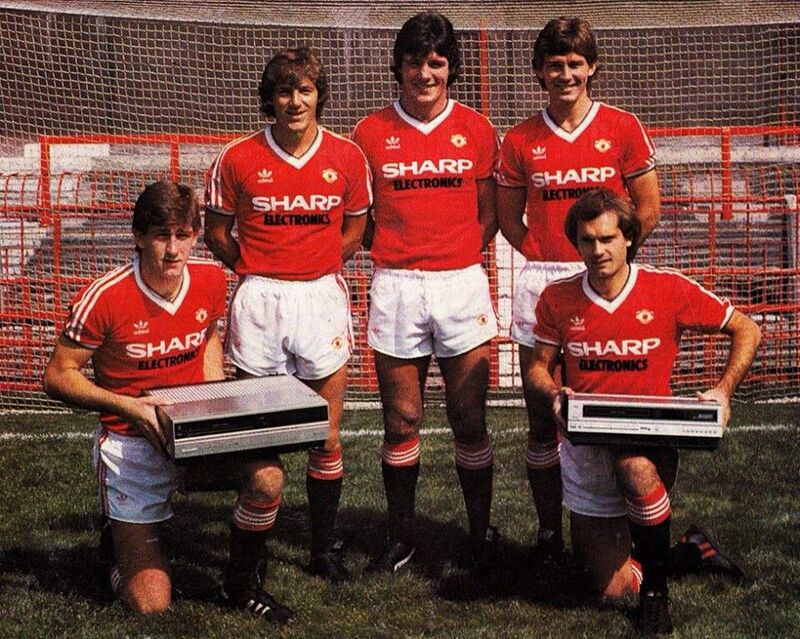 Here’s an odd picture of United players in their adidas uniforms holding a couple VCRs from their sponsor, Sharp (if their haircuts don’t give it away, the VCRs will surely tell you it’s the 80s). While they did capture three FA Cups during this time, league titles eluded them. Sir Alex Ferguson, the patron saint of Old Trafford himself, arrived in 1986, but the first of his 13 titles didn’t come until 1993, when they had switched to Umbro. 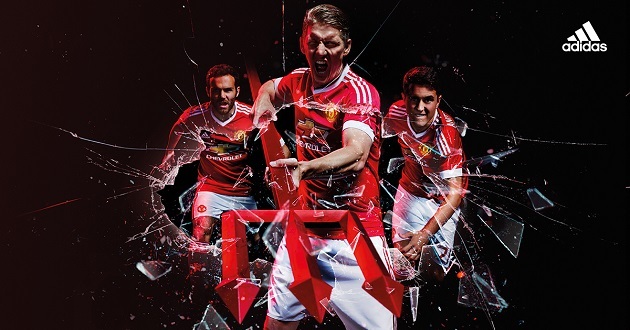 With the swap from Nike back to adidas this season, United fans are praying there’s no Adidas Curse. I’m trolling, of course. A club’s shirt manufacturer has no bearing on how well they perform, but it’s kind of fun to imagine an Adidas Curse, isn’t it? Anyway, Louis van Gaal brought the club back to Champions League relevance last season with Man U’s fourth place finish after a disastrous Moyes-fueled 2013-14. 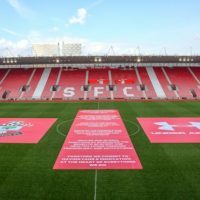 Van Gaal got started early on the transfer market this offseason, luring Dutch starlet Memphis Depay, then snagging German veteran Bastian Schweinsteiger and Southampton midfielder Morgan Schneiderlin. For his second year on the job, expectations of progress will rise with this fresh crop joining the talent already at hand. For this season’s jersey, adidas have kept things classic. 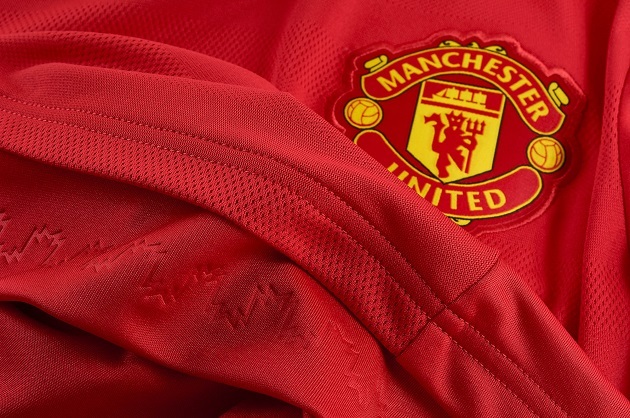 The United red is only disrupted by the clean collar and thick white sleeve ends. 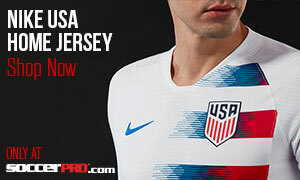 A key difference from Nike’s United tops, of course, is the white three stripes lining the shoulders. 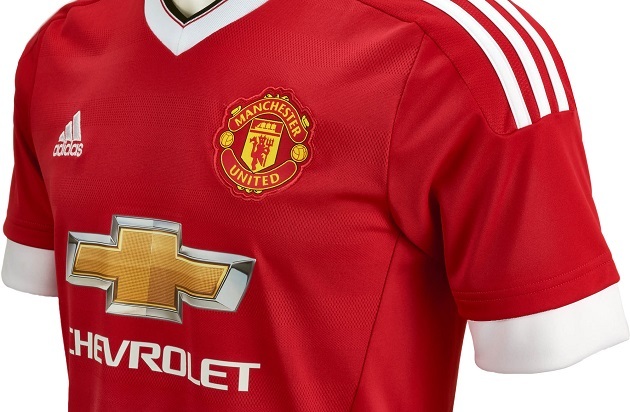 It’s a little strange to see the adidas logo right next to the United club crest on the front of the shirt. 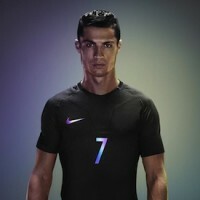 Other than that, it’s a similar shirt to last season’s home top. The bold Chevy logo still garishly sits in the middle of things. It would’ve been nice if they had done something different with it this time around. Re: the adidas marketing image above: Did anyone else notice that if there was more red in the background, we’d basically be looking at a recreation of 50 Cent’s Get Rich or Die Tryin’ album cover? I appreciate this kind of early-00s nostalgia. 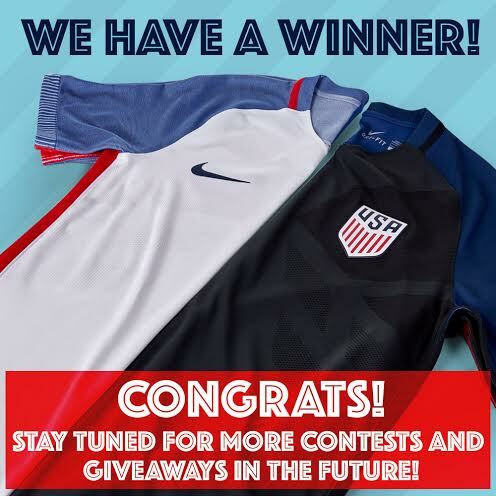 Anyway, grab your Manchester United jerseys at SoccerPro throw your favorite player’s name and number on the back while you’re at it.